Jagex's multiplayer arena combat game Transformers Universe launched in open beta on July 4 of this year. On January 31 it's shutting down for good. That was fast. "Today Jagex and Hasbro can confirm that Transformers Universe will close. This decision comes at an important time for both companies as they both realign their plans and focuses for 2015." Thus begins a post on the game's official website explaining why the free-to-play game would no longer be a going concern come the end of January. Some will say it died too soon. I say it lived too late. 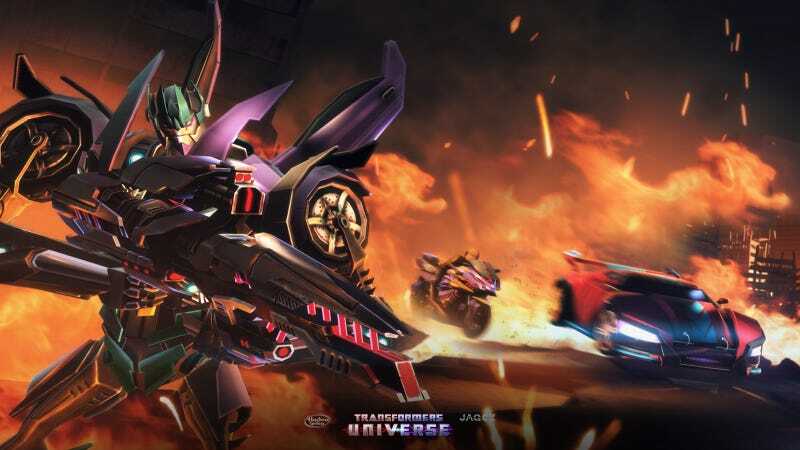 Based on the Transformers Prime cartooniverse, which ended with 2013's Predacons Rising special, the MMO launched into open beta at a time when one of Hasbro's top properties was in-between shows. With the new Robots in Disguise animated series kicking off in 2015 (the toys are hitting store shelves now) and the Transformers Universe toy line about to launch its big Combiner Wars series, there's really no need for a game based on a show that's not been a concern for over a year. Plus Transformers Universe sucked. That probably didn't help. I mean, I'm incredibly forgiving when it comes to Transformers video games, and I only played it once before putting it down and never going back. Players who invested in the free-to-play game's Founders Packs, relic bundles and starter packs should be receiving refunds within the next 30 days.